Henri Parens, MD has been named the seventh recipient of the Abraham L. Halpern Humanitarian Award of the American Association for Social Psychiatry. He will receive the award during the 2018 Humanitarian Forum, The Power of The Good, on Sunday, May 6th in New York City, at the 2018 Annual Meeting of the American Psychiatric Association. Benard P. Dreyer, MD, FAAP is the recipient of the 2017 Abraham L. Halpern Humanitarian Award of the American Association for Social Psychiatry. Dr. Dreyer is a general and development-behavioral pediatrician who has spent his professional lifetime serving poor children and families. 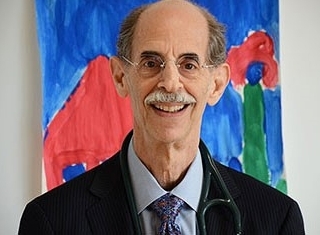 He is a Professor of Pediatrics at NYU, where he leads the Division of Developmental-Behavioral Pediatrics, serves as the Director of Pediatrics at Bellevue Hospital, and also works as a hospitalist. After graduation from NYU School of Medicine and chief residency at Jacobi Hospital, he stayed as Director of Emergency Medicine, starting the first Emergency Medicine Residency in NY State. Dr. Dreyer is the immediate past-president of the American Academy of Pediatrics (AAP). He serves as a member of the Executive Committee of the Section on LGBT Health and Wellness and the AAP Leadership Workgroup on Poverty and Child Health. Dr. Dreyer was also president of the Academic Pediatric Association (APA), and founded and chairs the APA Task Force on Childhood Poverty and the APA Research Scholars Program. He also hosts a weekly radio show on the Sirius XM Doctor Radio Channel, On Call for Kids. For over 30 years he led a primary care program at Bellevue, including co-located mental and oral health services and clinics in homeless shelters. His research is focused on interventions in primary care to improve early childhood outcomes, including early brain development and obesity. His work on addressing childhood poverty as President of the AAP caps a career of public service. He has fully engaged pediatricians in this effort and hopes to enjoin the rest of the house of medicine—including psychiatry--to participate in this extraordinary campaign for a healthy future for the nation. Nada L. Stotland, MD has been chosen as the fifth recipient of the Abraham L. Halpern Humanitarian Award of the American Association for Social Psychiatry. She will receive the award at the AASP Humanitarian Award Forum on Sunday, May 15, 2016 in Atlanta. Dr. Robert Jay Lifton was honored by the American Association for Social Psychiatry with the first annual Humanitarian Award at the May Meeting of the American Psychiatric Association in Philadelphia on May 7, 2012. Dr. Lifton was recognized for his devotion to promoting the social dimension of our work as psychiatrists. Dr. Lifton's recent book Witness to an Extreme Century was referenced as highly recommended. Participants at the award presentation who spoke both to his legacy and to the specific topics he has researched included R Rao Gogineni, MD, Abraham Halpern, MD, Robert Jay Lifton, MD, Steven Sharfstein, MD, Steven Moffic, MD, Driss Moussaoui, MD, and Henri Parens, MD.